It’s getting to that time of year when you should be dragging your retro out of hibernation and giving it some stick, and what better opportunity to do just that than getting out on track! 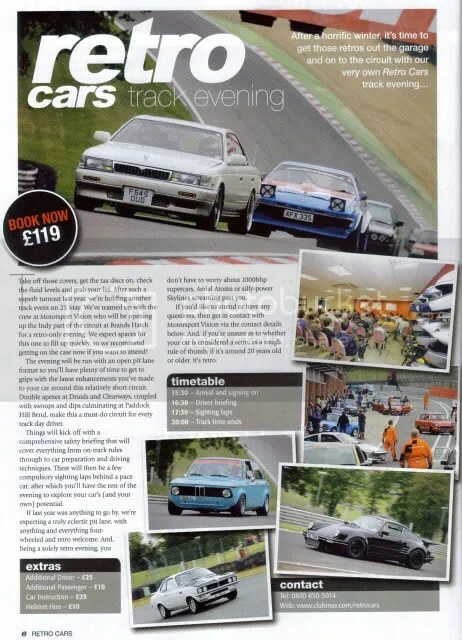 Retro Cars mag are running a track evening at Brands Hatch with Motorsport Vision on the 25th of May. If you’re wheels are over 20years old, you’re in. The format will be pretty laid back with a open pit lane meaning you can maximise your track time with the added bonus that you won’t be being chased down by million horsepower super cars or chavs! Now that’s not far off, so get booked up peoples and hopefully I will see you there in the KP! is there a price for spectating?